Increased specialization within the medical field also is driving demand for medical facilities that are purpose-built for particular specialties. 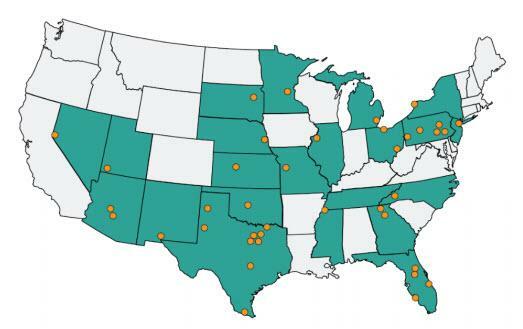 Well-located, acute-care hospitals and LTACs will still be critical components of the U.S. healthcare system. I'm warming up to this little gem, and this means I'm upgrading shares to a Strong Buy. 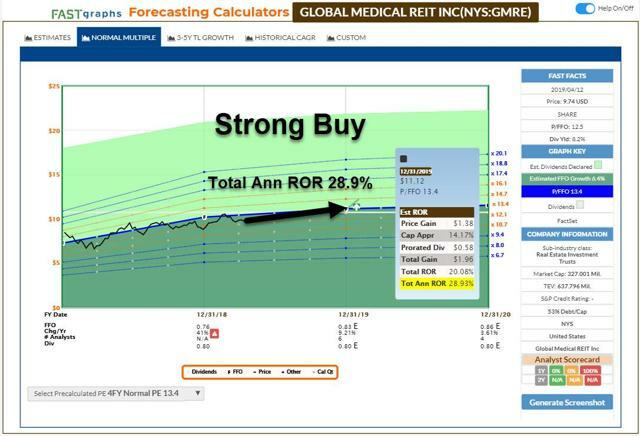 It has been almost two years since my last article on Global Medical REIT (GMRE), and in that initial research report, I concluded “GMRE could be the underdog, and I'm initiating a "buy." As you can see (above), a lot has changed in two years, but the most obvious change that I was hoping to see was an improved payout ratio. 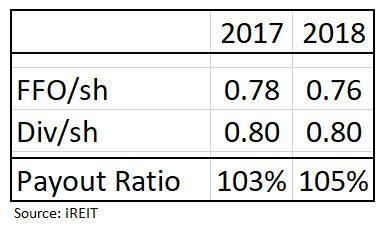 However, as viewed below, GMRE’s payout ratio in 2018 has not improved but has become worse. 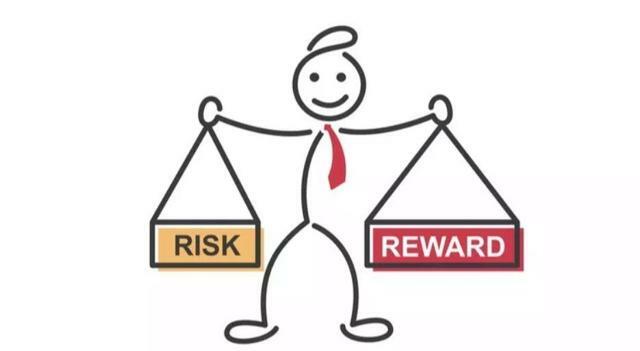 Now that I’ve laid out one of the biggest risks (dangerous payout ratio), let’s examine the fundamentals in order to determine whether or not GMRE can reduce risk (of a dividend cut). On the surface, the 8.2% yield is alarming, but it also could suggest an opportunity for enhanced price appreciation. 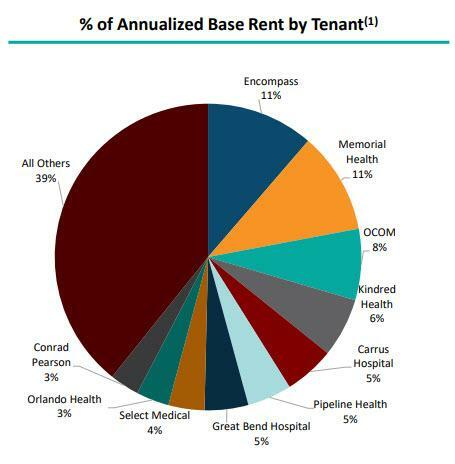 GMRE was formed in 2011 and is engaged primarily in the acquisition of purpose-built healthcare facilities and leasing of those properties to strong healthcare systems and physician groups with leading market share. The company is externally-managed and focused on licensed medical treatment facilities. Specifically, the REIT focuses on medical practices that deliver core medical procedures, such as cardiovascular treatment, cosmetic plastic surgery, eye surgery, gastroenterology, oncology treatment, and orthopedics. 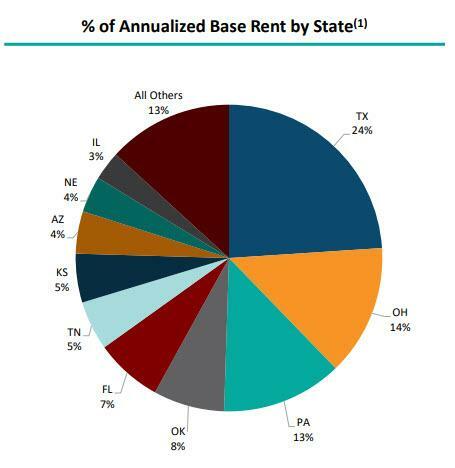 Some would argue that GMRE is a niche-based REIT that pursues an asset class that's "underserved" rather than more crowded categories such as assisted living, senior housing, and medical office. As of Q4 2018, the portfolio consisted of 84 properties totaling 2.1 million square feet at an average 8% investment yield. 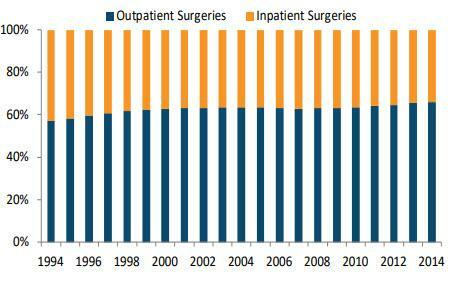 By asset type, 58.4% of the portfolio is medical office, service center or outpatient. 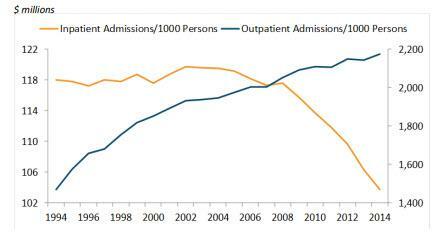 21.9% is rehab hospital, 7.5% is surgical hospital, 4.4% is general acute care hospital, and 7.8% is a mix of others. The continued shift in the delivery of healthcare services away from large, centralized facilities to smaller, more specialized facilities will increase the need for smaller, more specialized, and efficient hospitals and outpatient facilities that take advantage of these shifting trends. Procedures traditionally performed in large, general hospitals, such as certain types of surgeries, are increasingly moving to more conveniently-located, specialized facilities driven by advances in clinical science, shifting consumer preferences, limited or inefficient space in existing hospitals and lower costs in the non-hospital environment. Healthcare is delivered more cost effectively and with higher patient satisfaction when it's provided outside of a large, centralized hospital environment. Increased specialization within the medical field also is driving demand for medical facilities that are purpose-built for particular specialties. Despite the continued shift in the delivery of healthcare services to smaller, more specialized facilities, opportunities exist to acquire larger, acute-care facilities, such as acute-care hospitals and LTACs, with very attractive submarket fundamentals at compelling valuations and strong EBITDAR coverage. Despite the trends away from acute-care facilities, well-located acute-care hospitals and LTACs will still be critical components of the U.S. healthcare system. At year-end 2018, GMRE reduced its total debt to approximately $315 million from $332 million (at Sept. 30, 2018), net of an unamortized debt discount. The balance sheet (as of Q4 2018) includes $280 million drawn on the credit facility and $39 million of fixed rate notes payable. At Q4 2018, GMRE’s weighted average term of debt was 4.24 years, and the weighted average interest rate was 4.64%. During 2018, the company’s operating partnership issued 1.9 million OP units, valued at $18 million at an average issuance price of $9.60 per OP Unit. Also, in December 2018, GMRE sold 3.7 million shares of common stock through a public underwritten offering at $9 per share, generating gross proceeds of $32.9 million. Then, on March 14, 2019, GMRE issued a public offering of 7.25M common shares at $9.75 per share. 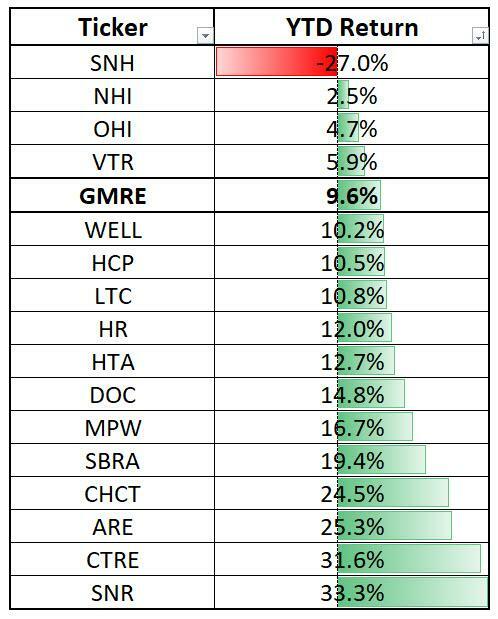 Keep in mind, GMRE is a small-cap REIT ($225 million market cap), so shares are much more volatile. 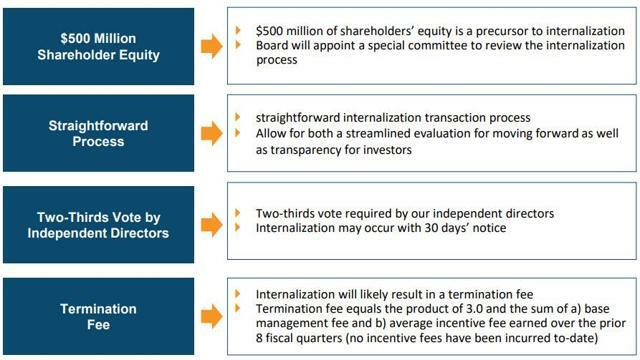 However, it’s also worth mentioning that GMRE is looking to internalize when shareholders’ equity approaches $500 million. GMRE said it has agreed with the advisor that the GMRE board will establish a committee of independent directors to discuss whether it will be in the company’s best interest to internalize. In 2018, GMRE achieved impressive results that include completing 14 transactions totaling 112,000 square feet for approximately $196 million, at an average cap rate of 8% and $242 per square foot pricing. 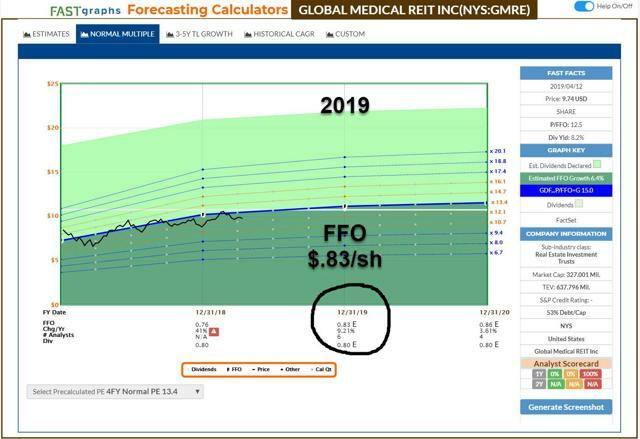 GMRE’s goal has been to buy a diversified portfolio of quality real estate leased to leading healthcare providers and secondary, tertiary markets at attractive risk-adjusted yields that are 100 basis points to 150 basis points above average. For the full-year 2018, GMRE’s net income attributable to common shareholders increased to approximately $7.7 million, or $0.35 per share compared to a net loss of approximately $1.8 million or a loss of $0.09 per share in 2017. GMRE’s FFO for Q4 2018 increased to $0.21 per share and AFFO improved to $0.20 per share, vs. $0.14 and $0.15, respectively, in Q4 2017. On a sequential basis, FFO and AFFO remained flat at $0.21 and $0.20 per share, respectively. 2018 FFO increased to $0.78 per share compared to $0.41 per share in 2017. AFFO increased to $0.76 per share compared to $0.54 per share in 2017. In March 2019, GMRE declared a $0.20 per share that represents an annualized rate of $0.80 per share. As noted above, the payout ratio is in excess of 100%. 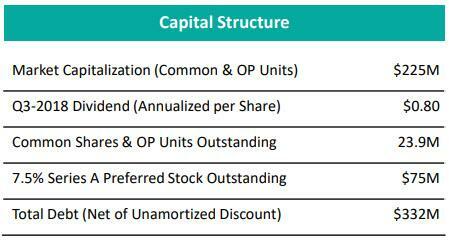 Can GMRE Grow Out Of Its Dividend? The real secret for GMRE is to grow the dividend. As noted above, the company raised around $70.7 million in Q1 2019 and has announced a few closings during the quarter ($20.6 million at average cap rate of 7.62%). 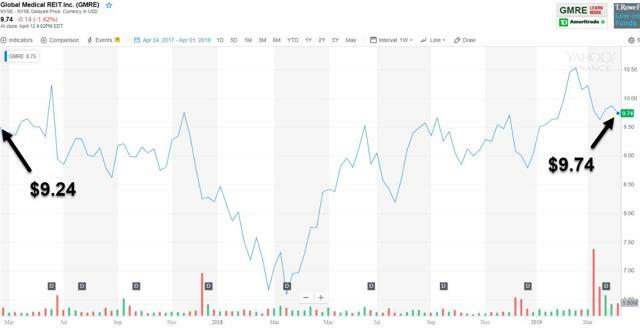 According to Seeking Alpha data, GMRE has four buys, one outperform, and one hold with an average price target of $10.92 per share. 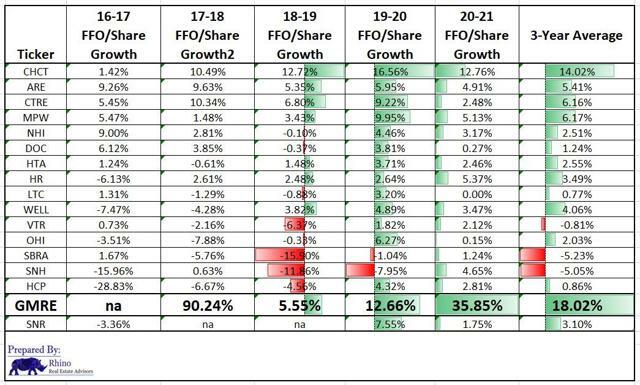 As you can see, GMRE is forecast to grow FFO/share by more than 5% in 2019, +12.6% in 2020, and +35% in 2021. Needless to say, these are analyst estimates, and it’s awfully hard to rely on predictions beyond 2019. However, there's strong consensus that GMRE will be able to cover its dividend in 2019. 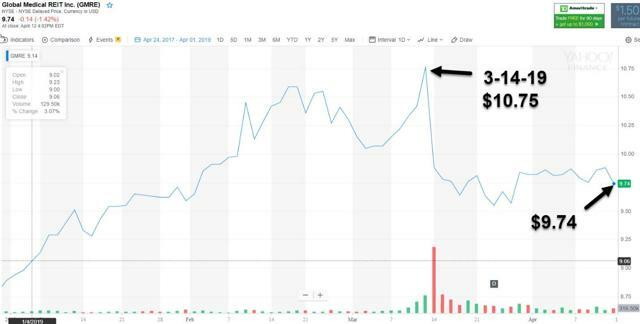 The Bottom Line: It has been almost two years since initiating a buy on GMRE, and it has taken a little longer for the company to cover the dividend. However, I'm warming up to this little gem, and this means I'm upgrading shares to a strong buy. (Remember: This one is a small cap, so I suggest maintaining adequate diversification). Final Note: I'm glad to see GMRE move closer to internalizing management, and I'm also happy to see experienced board members, including the recent new add, Lori Wittman (was formerly at Ventas and CareTrust). I look forward to meeting with management at the upcoming NAREIT conference in June. Disclosure: I am/we are long GMRE. I wrote this article myself, and it expresses my own opinions. I am not receiving compensation for it (other than from Seeking Alpha). I have no business relationship with any company whose stock is mentioned in this article.